I know I'm way behind the times in all sorts of ways, but I had to comment on the Met Gala that had lots of my fellow Catholics up in arms. If you didn't know, some of the Vatican's art collection is on tour and right now it's at the Met. The Church co-sponsored a gala of some flavor or another to bring attention to the collection. All manner of guttersnipes from the entertainment industry showed up, dressed up in what someone who has no comprehension of Catholicism thought were Catholic-themed gowns. Rihanna came dressed as a cheap, scrofulous prostitute whose clientele lean towards naughty-bishop role playing. A good time was had by all, save for the killjoy Catholics carping about the thing. The starlets got to demonstrate that their thighs don't rub, the fashion designers got to make something over-the-top slutty, the photographers got to shoot lots of pictures and the press was able to dredge up panelists to argue about whether or not this was blasphemous. First of all, Jesus came for just such as this. Rihanna might be a streetwalker with attitude, but in the eyes of God she's just as important as you or I. That she paraded her long legs around for everyone to see is what she does all the time and wearing a mitre doesn't make it any better or worse. The little girls influenced by her, getting knocked up outside of marriage and facing lives of poverty and desperation have the same future today as they did before this aesthetic catastrophe. What's the big? Maybe Rihanna got exposed to something sacred and it will have an effect down the road. Second, just look at her and the rest of them. Madonna looked like she was wearing a cemetary on her head. One of the actresses, well past her prime, was positively pathetic with her wrinkled visage and fitted couture gown. Horrific. It wasn't a crime against the faith, it was all of us taking advantage of women who are desperate for attention to get our jollies and yell. Finally, the Church sponsored the thing. What did they think was going to happen? Cardinal Dolan and the boys in the rectory surely knew it was going to end up like this. My guess is that they figured it didn't hurt to stir things up and get into the news. Plus, people heard about the exhibit, so maybe more will go to it. Some might even be inspired by what they see. 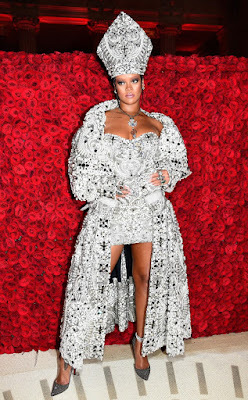 So yeah, the Met Gala was no big deal. Carry on.